If you're on a mission to break up with paper, receipts are high on the enemy list. They're little; they're pesky. They crowd your wallet, and you lose them. Chances are, though, that part of your business expense tracking involves maintenance and submission of these little sheets of doom. There will be a time in the near future where receipts cease to exist, but in the meantime, we have some interim technology solutions to help you get through this transition. The options we've listed below allow you to scan your receipts using your smart phone camera (and in one case, a portable scanner), organize and categorize your expenses, and keep digital copies in a virtual filing cabinet for your expense reports and personal records. Most importantly, it means you can throw those bad boys in the trash with the peace of mind that you will be fully reimbursed by your accounting department by following their submission guidelines. Here are the best of the best receipt tracking apps. Expensify, a great app that you might remember from our Best Expense Report Software for Sales Reps post, takes the manual labor out of filling out expense reports. Using your smartphone camera, you take a picture of your receipt and Expensify automatically identifies and pulls out the charges that you can then associate with a specific expense report. The app also tracks your mileage and time spent traveling in case you need to add this data to your expense reports as well. The best part: if you happen to lose a receipt (and you know you will), Expensify has an option that allows you to input charges directly from your credit cards for all goods and services less than $75. This will save you time tracking down and manually recording your spending history. Depending on your company's expense reimbursement policy, this feature could give you the chance to bypass dealing with paper receipts all together. The downside: Expensify's receipt scanning feature is not quite perfect at reading receipts, so be sure to check the data to make sure that it’s reporting your transactions accurately. Receiptmate brings receipt scanning to a whole new level. Instead of just storing pictures or PDFs of your recepts, Receiptmate saves your receipts with Evernote. With the wave of a finger (literally - you wave your finger over the total price of an item), your spending amount is saved in an Evernote document that you can access anytime from your Evernote account. Receiptmate also lets you view your transactions as a PDF or an Excel document, and you can customize the specific information that's tracked from each receipt. The downside: While Receiptmate is a fantastic organizational tool, we've heard their support team is a bit slow to respond. Receipts by Wave is a receipt management tool that merges all spending paths of your life. 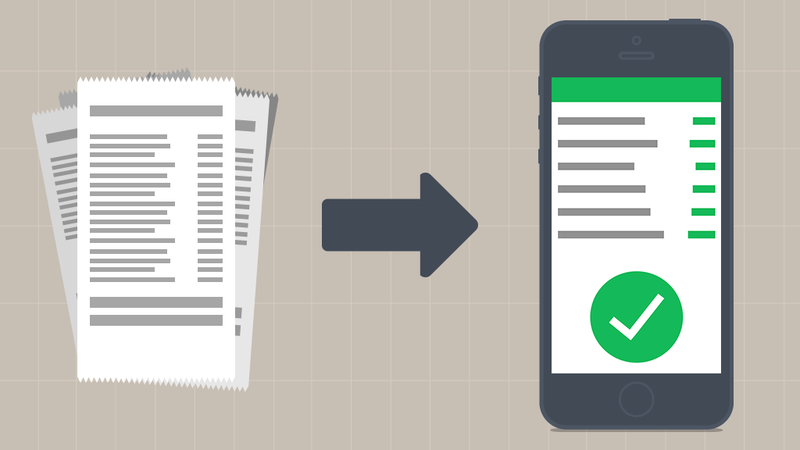 Using the Receipts by Wave software and app, you can integrate receipts from online orders, email confirmations, and physical paper copies into one organizational tool. Users must confirm purchase details in the app before anything is tracked, which ensures that the software is accurately reading the receipt. Additionally, Receipts by Wave is an organizational tool - you're asked to categorize each receipt, so you can quickly separate different business expenses. You can even manage your personal spending through the tool as well. The downside: This app doesn't work offline, so it's important to be connected to the internet to upload any document. This might mean saving your receipts for a few hours until you have time to input them all. SmartReceipt is another great tool for keeping receipts organized. The app, free with ads and $2.99 without, allows you to take pictures of receipts, save them as PDFs, and aggregate the content into professional weekly reports. SmartReceipt uses your activity to help track your spending and manage your budgets, predicting categories of spending based on the time of day. Additionally, if you travel overseas, the SmartReceipt software is able to report on most global currencies. One unique feature of the SmartReceipt tools is that it lets users input custom fields and export their receipts in CSV format to easily submit for reimbursement. The downside: There’s no cloud backup to store receipt information, so you have to rely heavily on the app and the reports that you email to yourself. This is apparently a feature that the team is actively working on. We generally support going an app vs. hardware route for your business needs. However, if you have a more general need for a handy portable document scanner or have concerns about the accuracy of receipt data coming from smartphone camera snapshots, you should check out NeatReceipt. NeatReceipt is a portable scanner that lets you quickly input receipts, business cards, and documents on the go. The small, lightweight scanner is 10.8’’W x 1.6’’D x 1.3’’H, doesn’t need to be charged, and works by uploading your data directly to a computer through a USB cord. Your scanned receipts become digital records, and these documents are searchable files, which is a great benefit if you need to search for specific expenses at a later date. Also, with each NeatReceipt purchase comes 30 free days of Neat Cloud space, letting you access your documents from any web-enabled device. The downside: At $179.95, it's significantly more expensive than its app alternatives. Also, because of the USB cord, you'll need to be near a computer when scanning your receipts. Hope our receipt tracking suggestions have made a tedious part of expense reporting a little easier. If you've had any great experience with the solutions above, let us know! If you're looking for more app recommendations, check out our posts on travel apps, calendar apps, and to-do list apps.